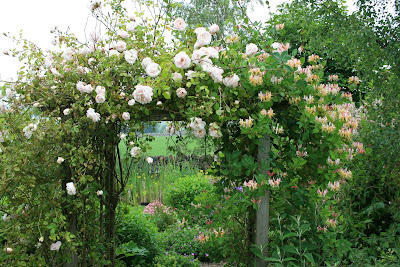 I am so chuffed with the top of the arch in my back garden - the New Dawn rose and the honeysuckle I grew from a cutting. Doesn't it look gorgeous? Someone in the village called me "dear" yesterday. It was a nice man, a man I like, but I loathe it when people call me "dear." I don't at all mind people - busdrivers, shopkeepers, the man on the market - calling me love, pet, darling, sweetheart and my duck, but when someone calls me dear, it feels as if they think I'm 93. So here I am, unable to look at my own first draft any more because I am sick of the sight of it, and a writer friend has asked me to look at something of hers. What joy! How easy it is to see when some little thing isn't working in someone else's text. How easy it is to write something like... I like this idea but I think you could phrase it more elegantly. Vividness is an ugly word. Yesterday I was asked - again - by someone I met at a party, "Do you have to be terribly self-disciplined to write?" and I said - "If the book is going well, writing is the only thing I want to do. I don't need self discipline." because the writing is going really well and I don't want to stop and anyway I have very nearly finished the first draft" - they would have to be churlish to say "Tough - do the jobs!" wouldn't they? Now I have finished the first draft, and I need self-discipline to do all the household jobs. Aaarghhh! 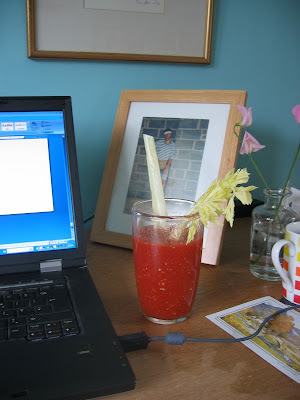 That's a celebratory bloody Mary, there. I don't usually drink in the morning. I've typed the last line of my book! I've done it! I got from A to B! (It's a good job Sally Howe isn't reading this, or she'd be telling me off for using all these exclamation marks.) Now all I have to do is go through the whole thing line by line and make sure it's perfect. That's all. And talking of Sally Howe, a regular reader of this blog - all right, my brother, Peter - emailed to say that he couldn't see the pictures for Sally Howe's world in the Gallery at the side of this page. So, apologies to anyone else who tried to see them and couldn't. Now they are fixed. Happy viewing, and as always, click on them to enlarge them. I haven't posted here for several days, because I have been so engrossed in the last few chapters of my novel - the one I'm writing. I haven't been able to think about much else. Last night I was so involved in the story, that I got upset with Dave over something he didn't do and then I realised that I was acting as if he had done what the guy in the novel had done. When I explained, he said - "Ah, just like the spaghetti hoops incident," which was when I bought spaghetti hoops for him, even though he doesn't like them, because I was confusing him with Gus in Plotting for Beginners. It's tough being married to a loopy writer. Today I have to start to write the final chapter. 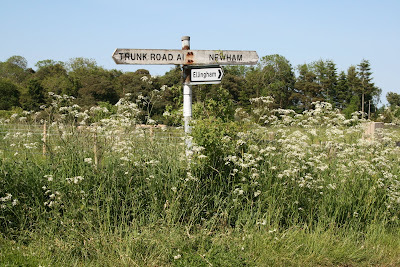 I know where it starts and where it ends, but I am not sure exactly how I am going to get from A to B. All through the night he was switching on the light to make notes on a pad he had on his bedside table. He viewed bird flu with as much horror as he viewed social interaction, and by the next morning he’d hatched a plan so in one fell swoop we could avoid them both. He regaled me with it over my porridge, while I was still waking up. Why couldn’t he be like other men at breakfast time, and read the paper? His bird flu plans centred on total isolation. He got the idea from Eyam - five miles away from Rowberry as the infected crow flies. When the plague arrived there from the great Wen in 1665, the local rector persuaded the villagers to isolate the village to prevent the plague from spreading to the rest of Derbyshire. 260 of the villagers died, but the plague was contained. “But that kind of activity is just up your street,” I said. 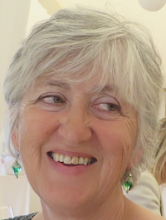 Sol delighted in helping people with practical problems – heaving away a cherry tree that a gale blew down on Mrs Bailey’s front path, putting a slate back on Chrissie’s roof, replacing broken windows in the village hall, unblocking Fiona and George’s loo. “The point is, Fran, that neither of us could be in contact with any corpses or we’d risk becoming infected,” he said. The next morning when I left for the advice centre, he gave me his lists, and I was charged with going to the Co-op at the end of my session. I filled two trolleys as high as I could pile them, with - probably not enough - loo rolls teetering on the top. As I was nearing the check out I bumped into Mrs Bailey. I tried to force a smile. When I got home, I helped Sol stack the booty in the shed, next to the tins of baked beans left over from his beat-the-millennium-bug escapade. 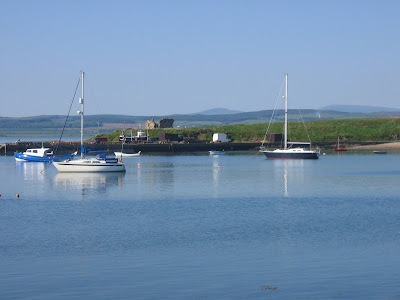 His other plans included opening the post wearing rubber gloves, or doing it bare-handed after waiting for the virus to die (12 hours for porous surfaces, 48 hours for non-porous surfaces); and secondly, preparing Gwen at the village shop to leave emergency items of shopping at the gate. He gave me his safety goggles from the shed to protect my eyes from bird flu virus droplets, and he ordered a pair from George’s catalogue for himself. He also planned to wear his chainsaw safety helmet with a visor so he didn’t inadvertently touch his face, apparently a fatal error for people with potentially infected hands. He allocated an old pair of swimming goggles to the cat. He went to the doctor’s to be vaccinated, but there wasn’t a phial of Tamiflu in sight. The best thing on offer was an ordinary flu jab, so he had to settle for that. He came home with a sore arm, a leaflet listing possible side effects, and a bad temper. “Why the hell isn’t the NHS better prepared?” he said. “Bloody politicians! I don’t think God does enough smiting these days. It should be the case that if a politician steps out of line, then SMITE!” He smashed his hand on the kitchen table, and the shock made me spill my tea down my front. The next day, he was still alive. A writer friend and I were talking about - well - what do you expect? 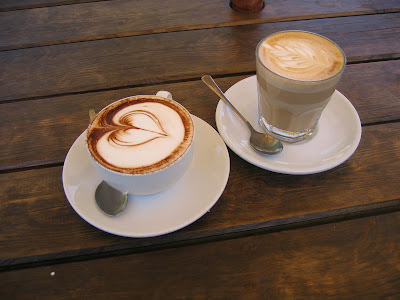 - writing - yesterday, and I was telling her what a great writing day I'd had - seven hours at one go, just breaking off to hang out the washing and have a bowl of muesli for breakfast and a sandwich for lunch, and all finished by 2 o clock. "I've done the fun part," I said. "I've written all the dialogue that sprung into my head without any bidding. 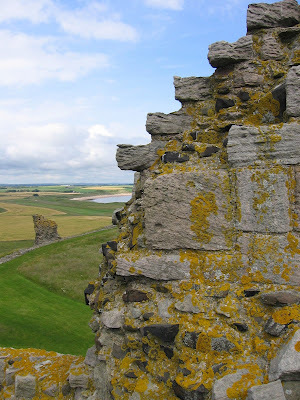 Now I have to do the boring bit - go through the text and add bits like she scratched her head and she sat back and folded her arms and she took another sip of her tea." "Ah yes," said my friend, scratching her head, "making your scene three dimensional. That bit's a real drag, isn't it?" 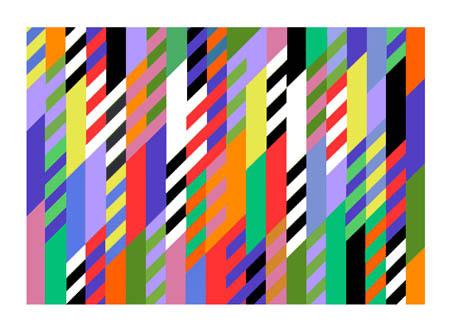 "If we were rich," I said, sipping my tea, "we could employ assistants, like Bridget Riley does. She thinks up the painting and then gets minions to help her with the actual execution. There's a job there, for impecunious writers: helping other writers change their strips of dialogue into three dimensional scenes. 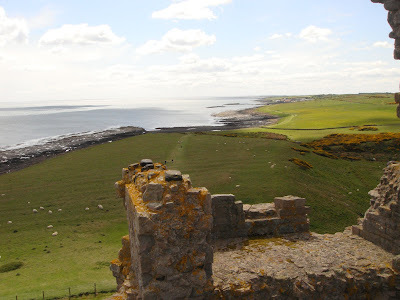 Or maybe we could persuade someone to do it for free as work experience..."
Looking south towards Craster from Dunstanburgh Castle - I've just turned from sorting out some card receipts from our holiday, to writing a scene that takes place in Northumberland, and it occurred to me that if I were an MP, I could call my holiday a fact-finding mission, and set my holiday expenses against my tax bill. After all, didn't I find out something important that I didn't already know? 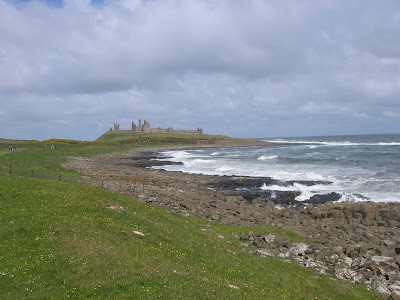 In the book, Sol (one of the main characters) has to use the phone box in Craster, and he says to Frances - his wife - "and then I ran back to the phone box above the harbour, you know - that one on the corner - but it only takes credit cards now - what bloody use is that?" If you need cheering up, watch this. I could see Victoria Wood playing the part of Sally Howe in a televised version of Plotting for Beginners. What do you think? 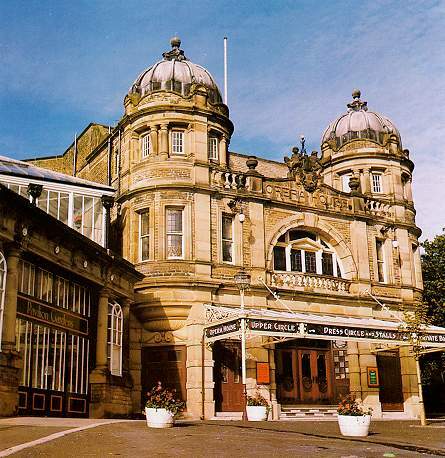 I am appearing at the Buxton Festival on the afternoon of Monday 20th July. Why not come along? Click here for details. But I am at the Leewood Hotel, no matter what the website says. Sorry not to have posted for a while - we have been in heaven - i.e. 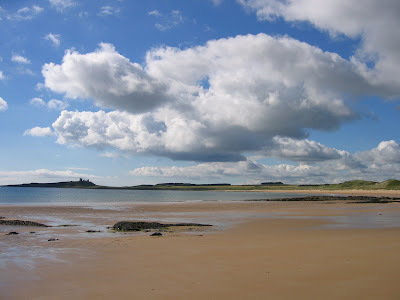 the coastal plain of north Northumberland.